I try to eat healthy. My menus range from Vegan to Raw, Paleo, Fruititarian, Dairy Free and Gluten Free. With these variations it is super important to keep up with your bodies need for protein. 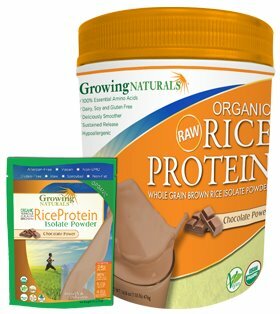 Growing Naturals sent over their Rice protein Isolate Powder for review. We received both vanilla and chocolate flavor packs. Both flavors are absolutely delicious. I love it when stuff that is good for you tastes amazing. Blends smoothly and has no cholesterol is low in carbs and sugars. These guys use Organic Stevia as a sweetener. Available in Vanilla, Chocolate and Original. Great Whey Substitute: 96% correlation to whey protein’s amino acid profile but better yet, minus the dairy and allergens. Want to keep up with all things Growing Naturals? You can like em on Facebook and follow em on Twitter. Ready to buy? Head on over to Growing Naturals and get ya some of these great for ya organic products.